Island visited by 26 members. Ireland's Eye is situated about 1.5kms north of Howth Harbour. In Celtic times it was called Eria’s Island and then Erin’s Island. The Norse called it Erin’s Ey and this became Ireland’s Eye. (Ey is the Norse word for ‘Island’), Another name for the island, Inis Mac Nessan, refers to St Nessan who built a church here in the 8th century. The island is easily reached by a regular boat service from the West Pier at Howth. The crossing takes about 15 minutes.. This is an island of great interest, both physically and historically. It is 54 acres in size, with sandy beaches and low lying swathes of grassland rising up to the rocky cliffs on the N and E side. Some craggy tors on the NE corner of the island provide a visual feast. 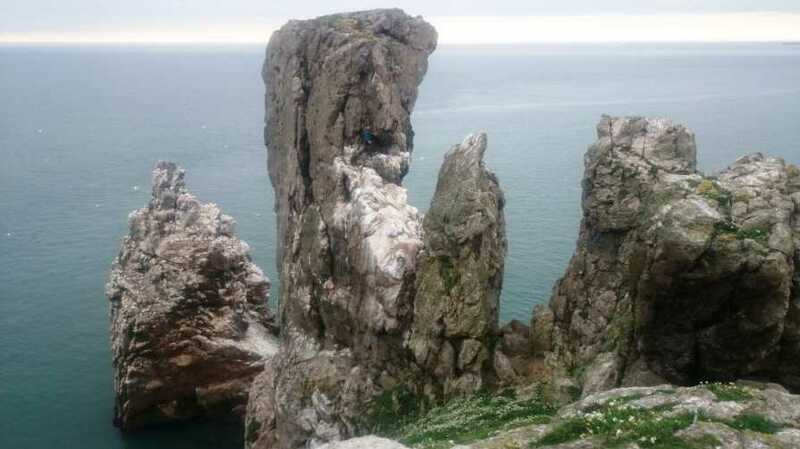 The largest is called ‘The Stack’ and the sheer amount of guano that climbers must navigate over is cause for mirth. (if you are not the one climbing). Speaking of guano, the island is home to a gannet colony, as well as guillemots, fulmars, puffins, cormorants, razorbills, gulls and other seabirds. Grey seals are often seen around the rocks too. Wildlife that isn’t advertised is the rat population – having camped on the island twice in recent years (with permission from the owner), I can testify to rats running out of one hole, running across camp to disappear into another hole, reappearing from a third hole, to disappear into a fourth hole etc. Like a chase scene from Scooby Doo! There is a Martello Tower on the NW corner of the island. The boat will drop you either to the E or W of the Tower, depending on tides. Both landing places require navigating steps over the rocks. The Tower was built in 1803 in anticipation of an invasion by Napoleon. Besides the Tower there are the remains of the 8th century church built by St Nessan. These are the only buildings on this uninhabited island. The summit can be reached in 20 minutes. Besides the rabbit and rat holes there are large areas of difficult long grasses to navigate if exploring the island further, especially around the ruined church. Views include Lambay, Howth, North Dublin coast and out to the Irish Sea. As mentioned, seabirds and seals abound, especially on the N and E rocky sides of the island, but care needs to be taken if exploring there.